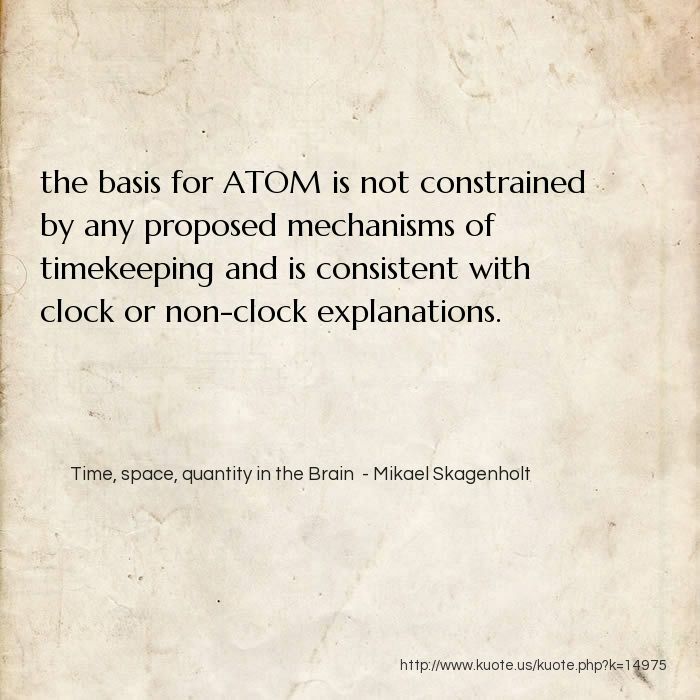 the basis for ATOM is not constrained by any proposed mechanisms of timekeeping and is consistent with clock or non-clock explanations. 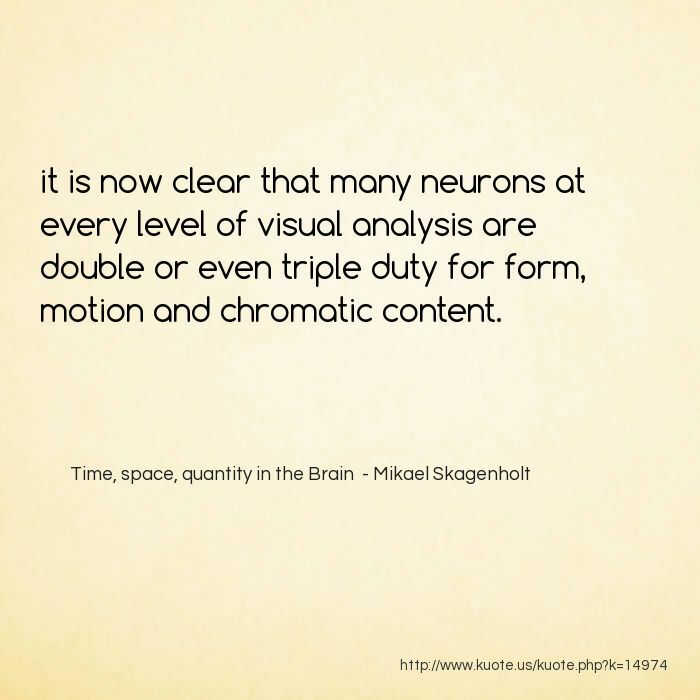 it is now clear that many neurons at every level of visual analysis are double or even triple duty for form, motion and chromatic content. 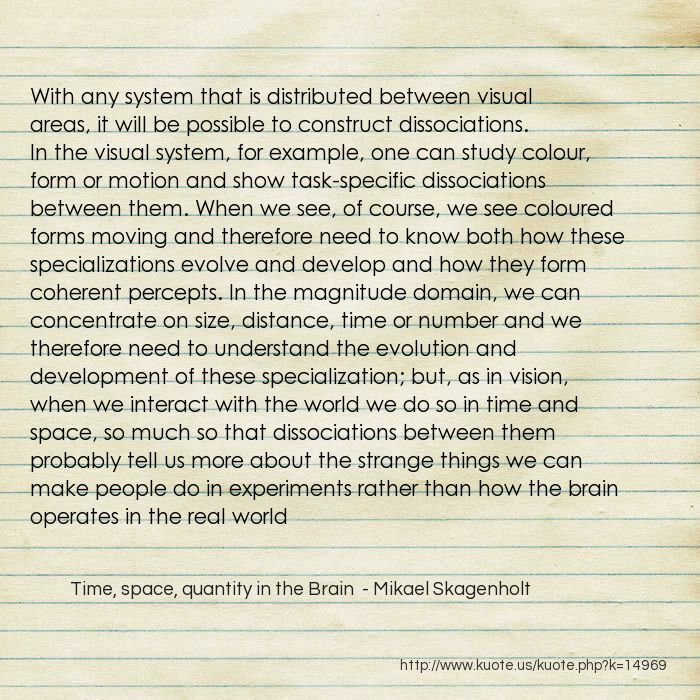 The proposal is that we learn about space and time through action and associations between space, time and magnitudes relevant for action (such as size, speed and, under some conditions, luminance and contrast) will be made through action. 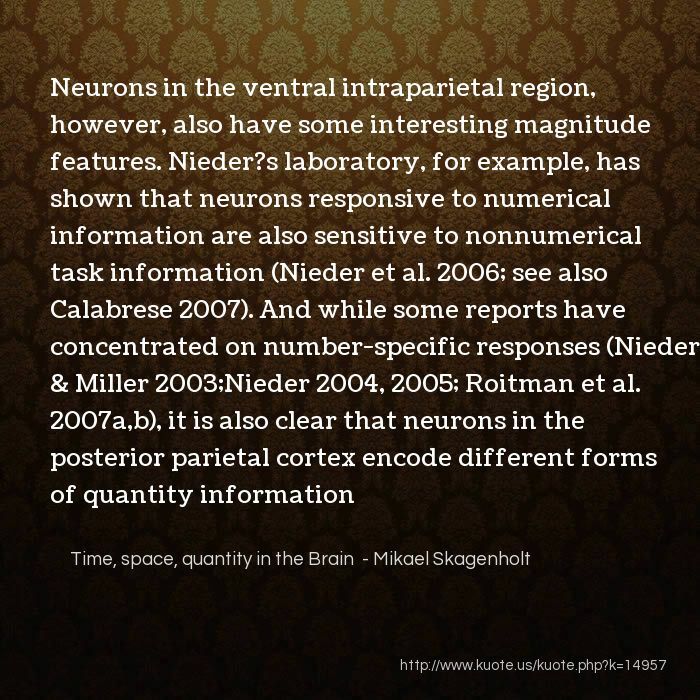 When we later learn about number, the neurons with capacity to represent quantity are those that have information about the continuous variables learned about motorically. 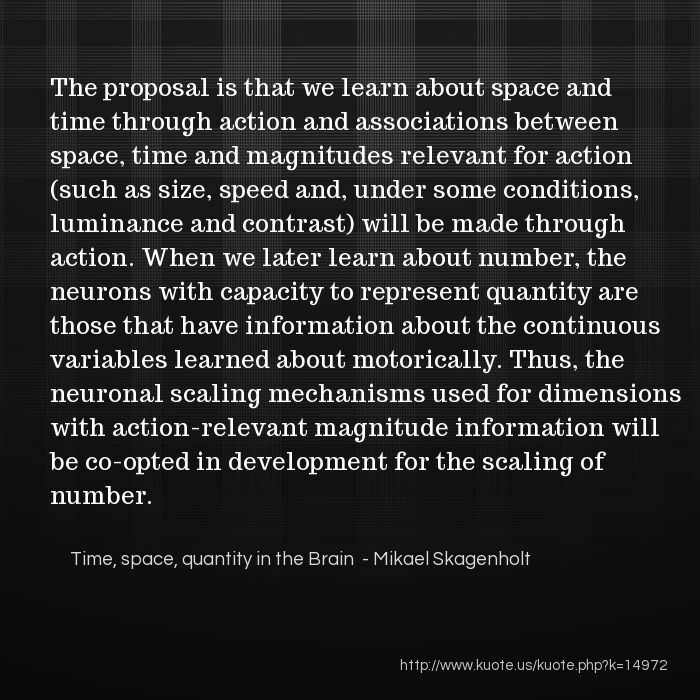 Thus, the neuronal scaling mechanisms used for dimensions with action-relevant magnitude information will be co-opted in development for the scaling of number. 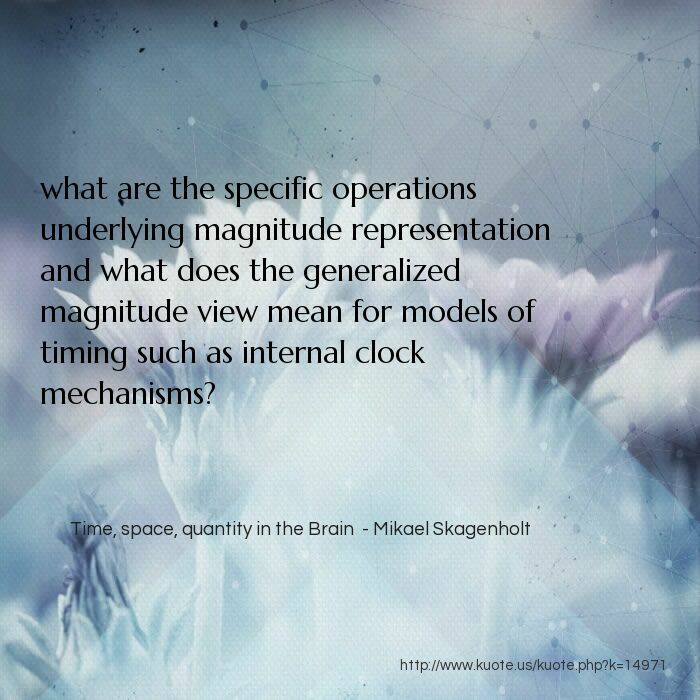 what are the specific operations underlying magnitude representation and what does the generalized magnitude view mean for models of timing such as internal clock mechanisms? 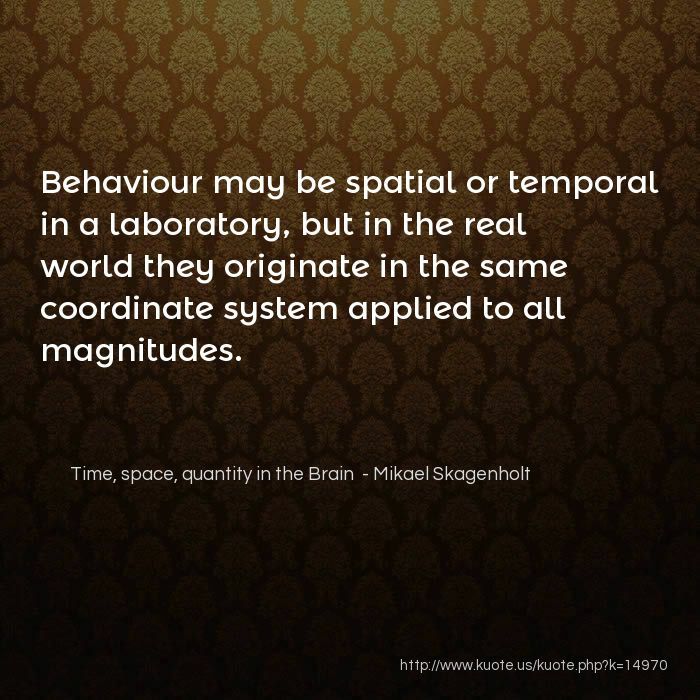 Behaviour may be spatial or temporal in a laboratory, but in the real world they originate in the same coordinate system applied to all magnitudes. 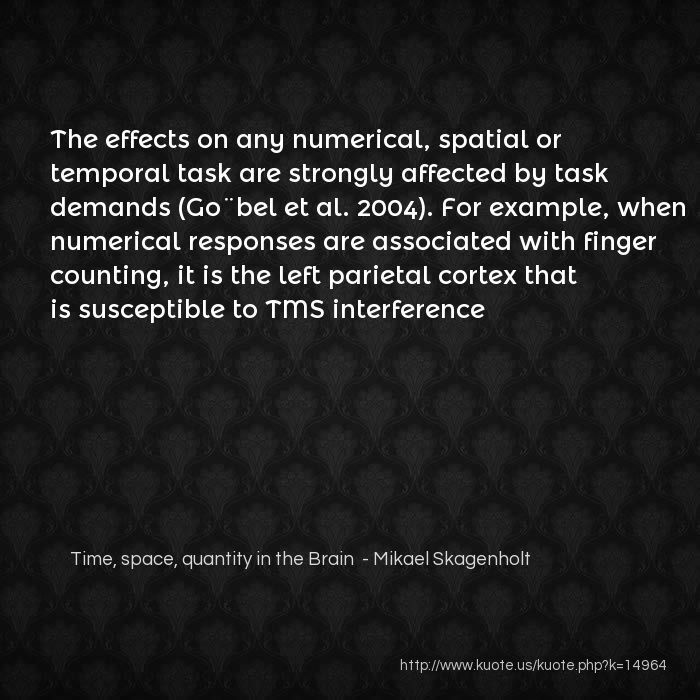 Owing to the association of numerical mapping with space, there is an emphasis on right hemisphere functions, but it is clear that explicit numerical operations and motor action selection and preparation rely on left parietal cortex mechanisms. 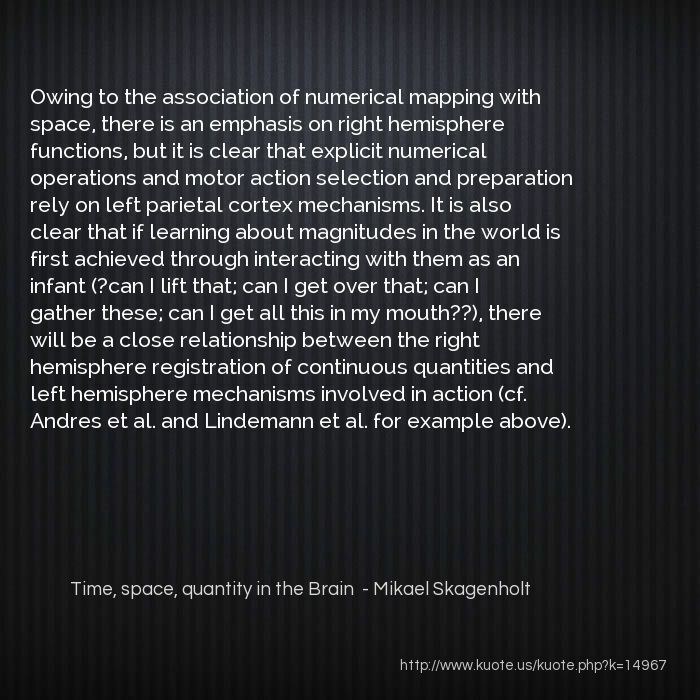 It is also clear that if learning about magnitudes in the world is first achieved through interacting with them as an infant (?can I lift that; can I get over that; can I gather these; can I get all this in my mouth?? 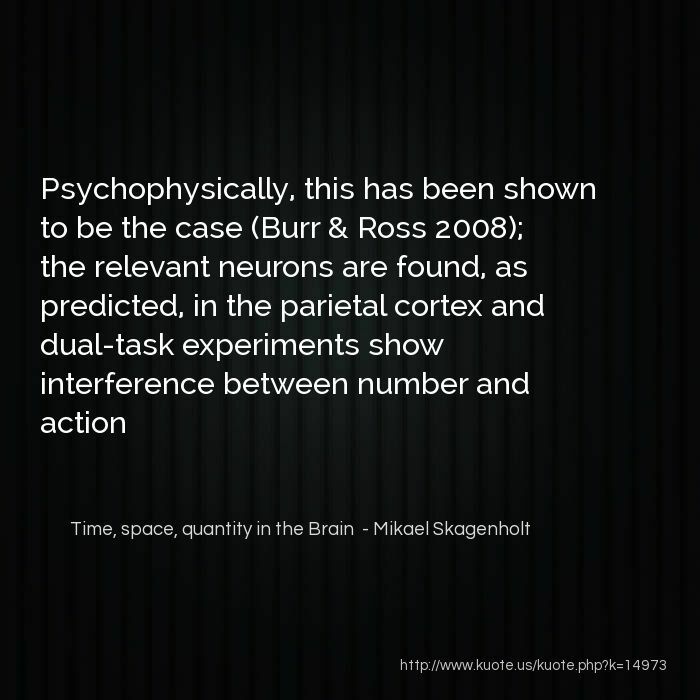 ), there will be a close relationship between the right hemisphere registration of continuous quantities and left hemisphere mechanisms involved in action (cf. Andres et al. 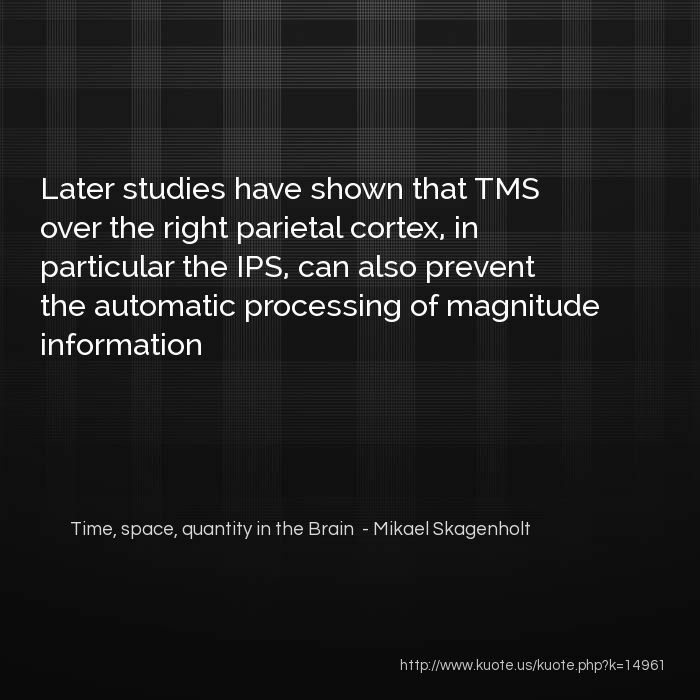 and Lindemann et al. for example above). 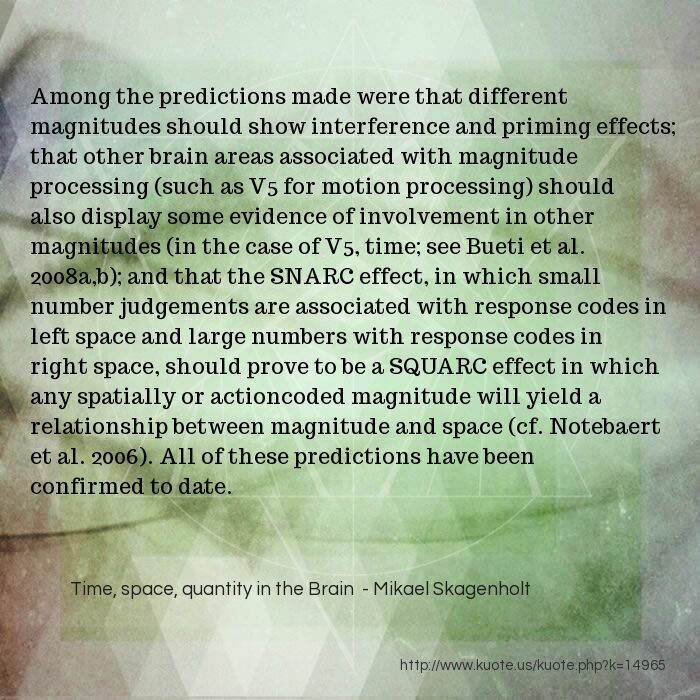 Among the predictions made were that different magnitudes should show interference and priming effects; that other brain areas associated with magnitude processing (such as V5 for motion processing) should also display some evidence of involvement in other magnitudes (in the case of V5, time; see Bueti et al. 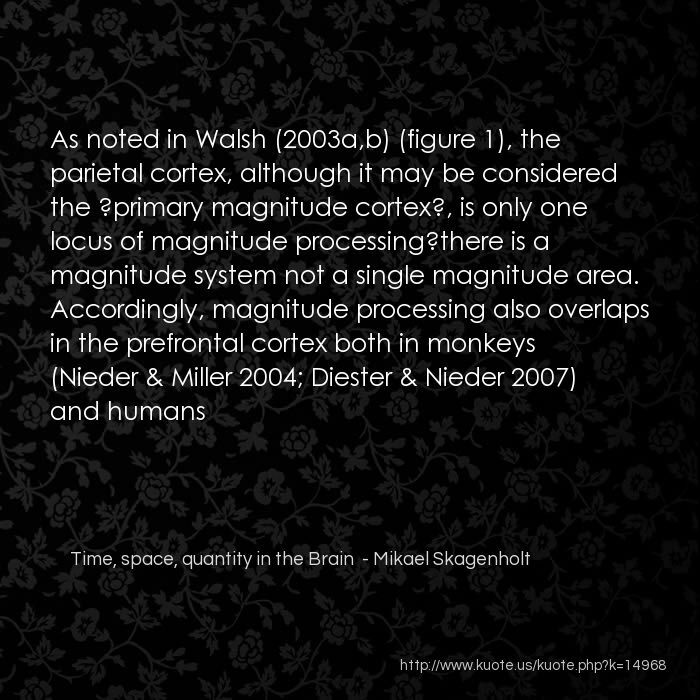 2008a,b); and that the SNARC effect, in which small number judgements are associated with response codes in left space and large numbers with response codes in right space, should prove to be a SQUARC effect in which any spatially or actioncoded magnitude will yield a relationship between magnitude and space (cf. 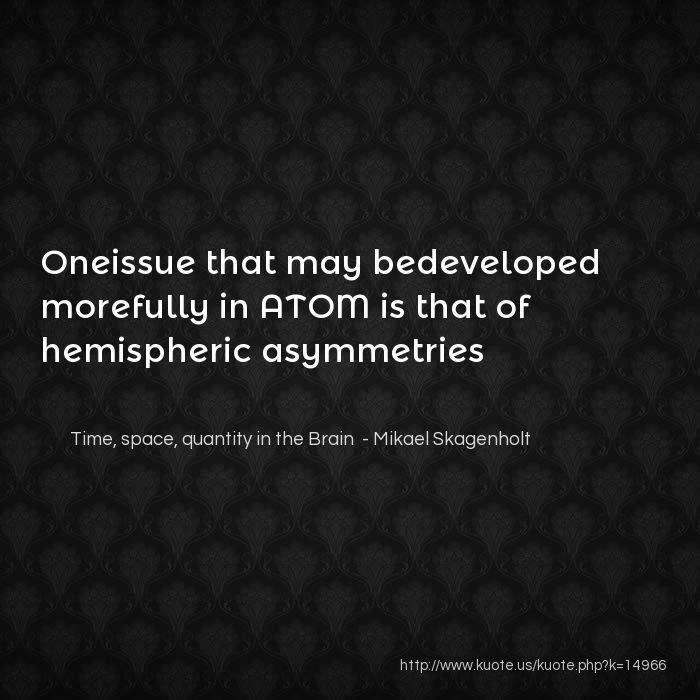 Notebaert et al. 2006). All of these predictions have been confirmed to date. Knops et al. 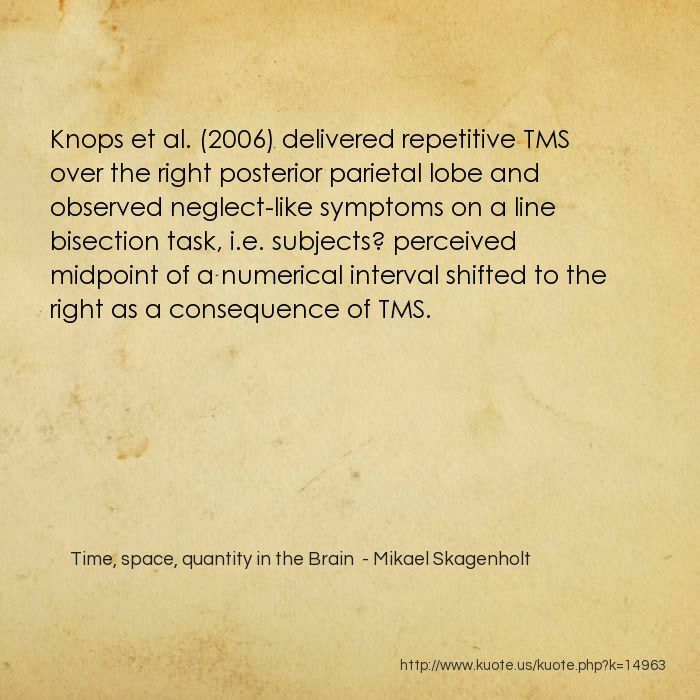 (2006) delivered repetitive TMS over the right posterior parietal lobe and observed neglect-like symptoms on a line bisection task, i.e. subjects? 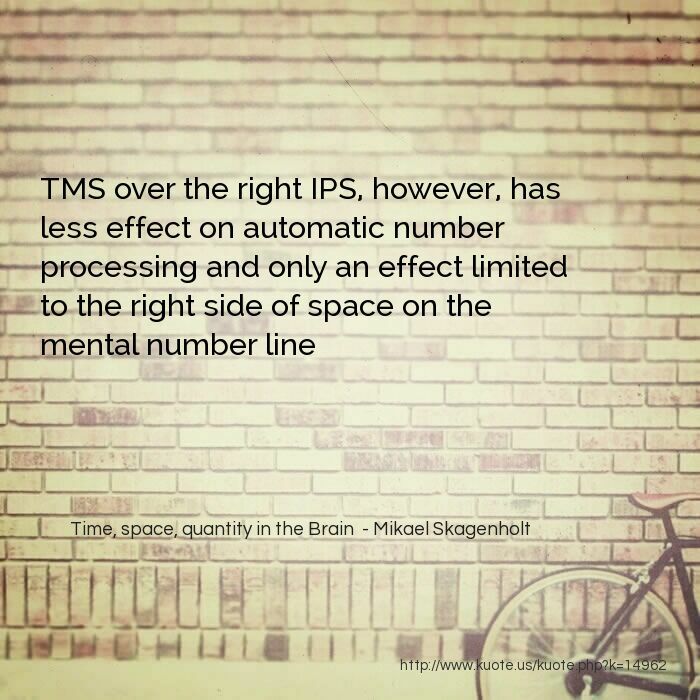 perceived midpoint of a numerical interval shifted to the right as a consequence of TMS. 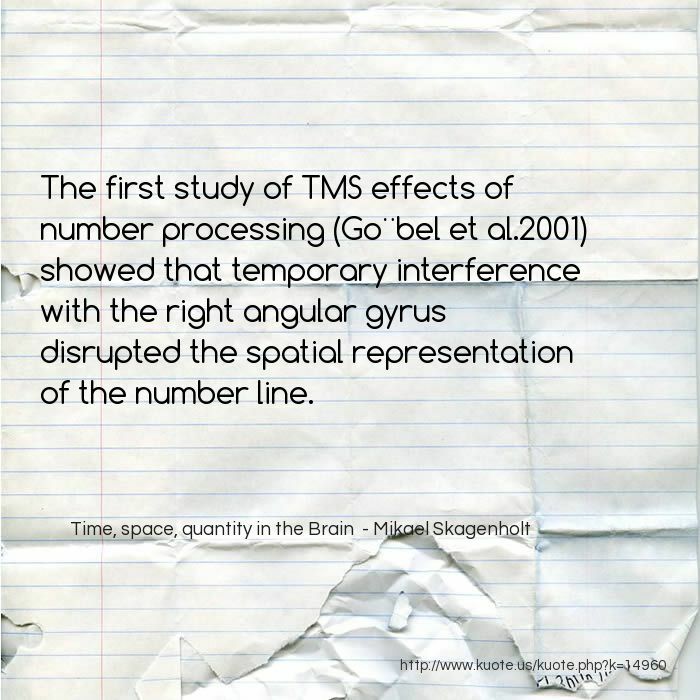 The first study of TMS effects of number processing (Go¨bel et al.2001) showed that temporary interference with the right angular gyrus disrupted the spatial representation of the number line. 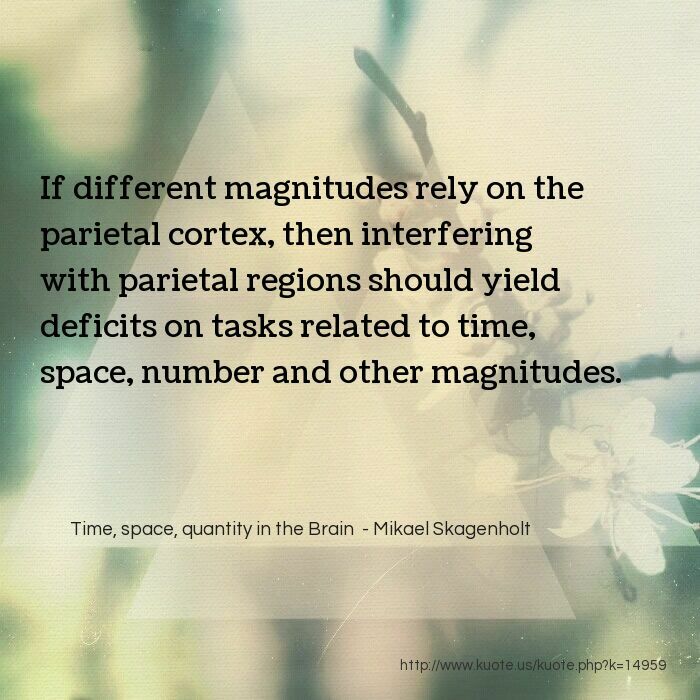 If different magnitudes rely on the parietal cortex, then interfering with parietal regions should yield deficits on tasks related to time, space, number and other magnitudes. Sawamura et al. 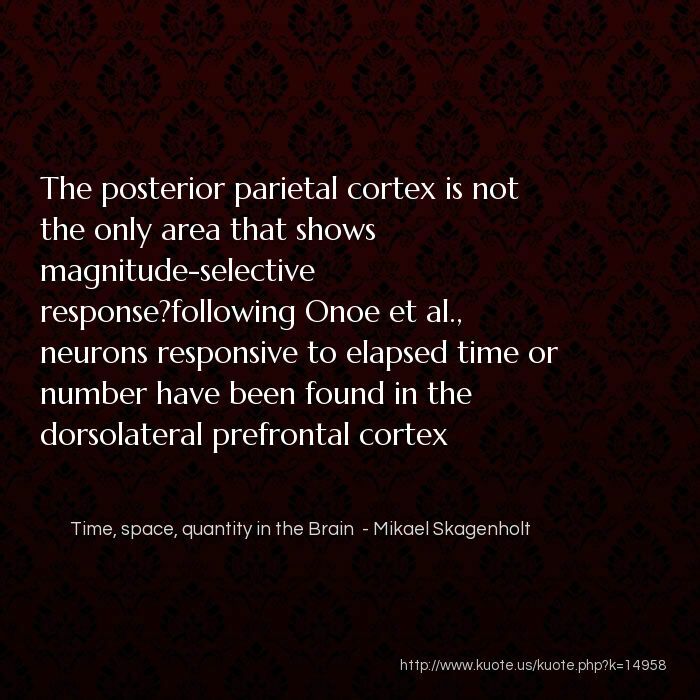 (2002) recorded number-selective neurons in the intraparietal sulcus and superior parietal lobule (see also Sawamura et al. 2006). 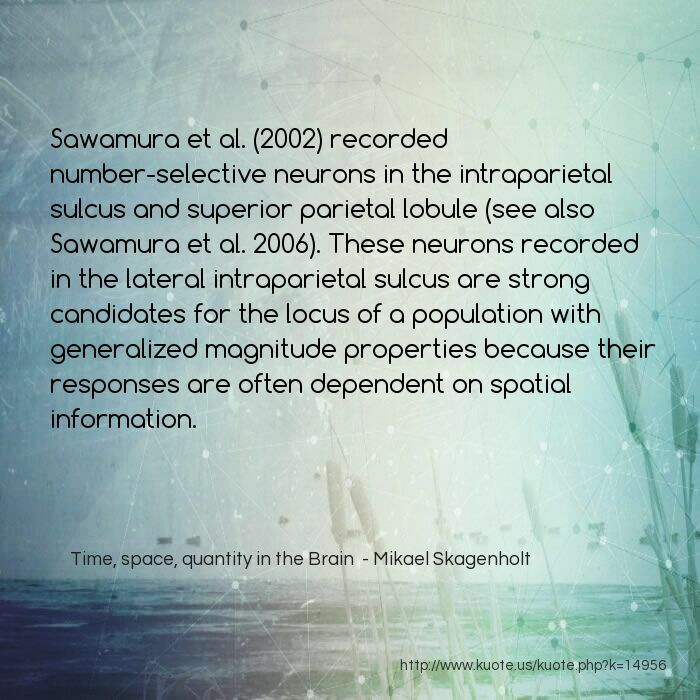 These neurons recorded in the lateral intraparietal sulcus are strong candidates for the locus of a population with generalized magnitude properties because their responses are often dependent on spatial information.